Tomorrow is the Arizona Primary 2018 , with polls open 6 a.m. to 7 p.m. Many have already voted early, being on the PEVL (Permanent Early Voting List). If you don’t vote tomorrow, please mark your calendar for the November 6, 2018 General Election. Up for re-election this year are the Arizona state officers (Governor to Mine Inspector), one U.S. Senate seat, all 9 Congresspersons, the State Senate and State House (2 in each legislative district) , various school board members, and Justices of the Peace. 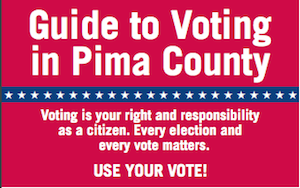 More info here by the League of Women Voters of Greater Tucson’s Guide about voting in Pima County. It’s your civic duty to vote as U.S. Citizens. The Guide is in English and Spanish. The LWVGT is non partisan, and members are both men and women. 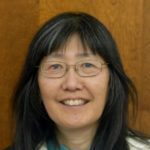 Voter registration stats (from Arizona Sec. of State website): registered Democrats in Pima County – 200, 943, registered Republicans 157,706, registered as Other 160,746. Registered as Green 1,485 and Libertarian 4,100. Vote wisely on or before August 28, 2018. It’s AZ Primary Election day. Checked voter turnout 2 years ago on 8/30/16 and Pima County’s was 34.6% , statewide lower at 29.10%. Go out & vote today, or don’t forget to drop off your early ballot at your polling place.